ITSENCLOSURES recently deployed an all-weather LCD enclosure at the John Glenn Columbus International Airport in Columbus, OH. The LCD enclosure was commissioned by COTA, The Central Ohio Transit Authority, to display bus schedules for airplane passengers traveling to downtown Columbus. 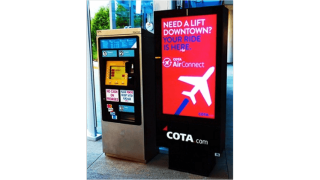 In the winter of 2016, COTA contacted ITSENCLOSURES about installing a digital sign at one of the COTA bus stop terminals at the airport. After reviewing various options, COTA made the decision to install ITSENCLOSURES’ newly introduced fan-cooled LCD enclosure. The all-weather enclosure is paired with a 47-inch high-bright LCD panel to combat direct sunlight and high ambient light. When compared to previous models, the LCD panel displays more vibrant colors, and reduces energy consumption. A standalone media player for creative content is also part of the solution. The LCD enclosure includes a filtered fan system, built-in heater, and temperature monitor to ensure 24/7 operation in a temperature range of minus 20 degrees to 110 degrees Fahrenheit with direct sunlight exposure. To reduce maintenance, the enclosure utilizes hydrophobic air filters that only need to be replaced every three to five years. JT Spangler, president at ITSENCLOSURES, recently visited the John Glenn Columbus International Airport to inspect the installation. He was happy with the enclosure’s performance. The LCD enclosure is located outside of the AirConnect shelter near the passenger taxi stand. The enclosure displays real-time COTA bus schedules from the airport to downtown Columbus and serves as extra branding and awareness for COTA. Passengers are also able to purchase tickets at a kiosk to the left of the digital sign. This configuration could be placed all over Columbus in the future. COTA has immediate plans of installing additional enclosures at the Northland transit line in the fall of 2016.